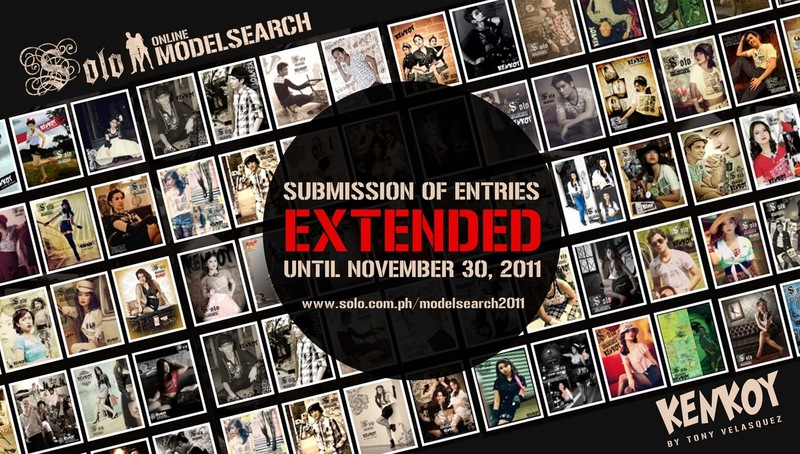 ruthdelacruz | Travel and Lifestyle Blog : Solo x Kengkoy x Model Search for 2012 is EXTENDED!!! Solo x Kengkoy x Model Search for 2012 is EXTENDED!!! Kengkoy is requesting for more entries for the Solo Kengkoy Model Online Search 2012! No joke. If you are an aspiring model, or has an eye for photography, Kengkoy wants you!!! The search for the next faces of Solo for 2012 is EXTENDED due to popular request! Submission of entries is extended until November 30 and Voting ends on December 2. Solo Online Model Search gets bigger on its 3rd year as Solo celebrates and relive the greatest and most-loved comic character of all time KENKOY created by the Father of Philippine Cartoon Tony Velasquez (read more about Kengkoy in this blog entry). After successfully launching Jaggy Tallada and Jhonna Flor as 2010’s grand winners and Mehran Khaledi and Phoebe Rutaquio as 2011's grand winners, Solo is on search for two new faces to be officially unveiled in 2012. You could be Mehran (oh, nice name!) or Phoebe - whose faces grace the campaigns of Solo Store! If I am not too old for modelling, I would have joined. Hehe Don't be threatened, go to www.solo.com.ph/modelsearch2011 for more info. To give you a little insight about the model search. Here is the criteria: 30% Voter’s Choice and 70% Solo’s Choice (40% for Being Photogenic, 20% for Creativity and Styling and 10% Layout) for a total of 100%. The highest scorers: 10 Male Photo Entries and 10 Female Photo Entries will be the finalists. The top 20 finalists will have a go-see and interview with the judges. Cash Prizes and gift certificates await the grand winners for Best Male and Best Female Photo Entries, as well as their partner Graphic Artist/Photographer. There are also prizes for the lucky voters so keep your votes coming in and you might win Solo shopping GCs! © ruthdelacruz | Travel and Lifestyle Blog : Solo x Kengkoy x Model Search for 2012 is EXTENDED!! !